The game maker is set to make a big splash in China's booming mobile esports market. It's been a rough few months for owners of technology stocks, and in particular, companies which derive most of their revenue from video games. Activision Blizzard (NASDAQ:ATVI) issued a third-quarter earnings report in early November that fell below Wall Street's expectations, but the company still posted solid results overall. When a stock suddenly drops 38% in just three months, it's easy to assume the worst for a company, but Activision is still very profitable, generating over $7 billion in annual revenue, and is investing in promising growth initiatives. Now could be a great time to consider picking up shares of one of the leaders in a growing $138 billion industry. Let's take a look at three initiatives underway right now that could make a big difference in the company's fortunes going forward. While 2018 was the year of esports for Activision, next year may be the year the company's consumer products business takes off. Earlier in 2018, Activision announced a partnership with top toy makers Hasbro and Lego to manufacture and distribute Overwatch-themed Nerf blasters and Lego sets. What's interesting about these partnerships is that Hasbro and Lego are currently struggling to grow. Both toy companies had a tough year due to the Toys R Us bankruptcy. Hasbro's revenue was down 8% over the last year, while LEGO reported just 1% growth in revenue in the first half of 2018. Hasbro and Lego are leading toy brands that generate about $5 billion in annual revenue each. These companies want to spur new expansion, and they both see the popularity of Activision's Overwatch aiding their growth objectives in 2019. That says a lot about the brand relevancy of top video game franchises in the world of entertainment today. Esports has become one of the key growth initiatives for Activision over the last few years. Things kicked off in a big way in 2018 with Overwatch League. CEO Bobby Kotick believes esports will reach a similar scale as traditional sports. However, Overwatch League is just one cog in the wheel of the company's esports strategy. Activision is partnered with Chinese social media giant Tencent Holding (NASDAQOTH:TCEHY) to distribute a mobile version of Call of Duty in China, which has the potential to be a big moneymaker for the company. Activision is taking "the biggest action franchise of the last two decades to the largest gaming market in the world," as COO Coddy Johnson explained on the company's third-quarter conference call. Also, Blizzard recently announced Diablo Immortal -- a mobile version of the classic PC franchise. The announcement at BlizzCon in early November received a hostile response from gamers, but the company sees an opportunity to reach a significant worldwide audience for this classic PC franchise. Blizzard is partnered with NetEase (NASDAQ:NTES), another top Chinese game company, to develop Diablo for mobile devices. Both of these games could be very successful as esports titles. Mobile esports games have swelled in China, accounting for 24% of the top grossing titles on Android devices, according to industry researcher Newzoo. The company that dominates the Chinese mobile market is none other than Activision's partner -- Tencent. Tencent has successfully leveraged its popular social media platforms like WeChat to distribute titles to a Chinese audience that currently has an insatiable demand for video games. Tencent controls a 50% share of all mobile esports titles in China on Android devices and has a 63% share of mobile esports games on iOS. It's clear Tencent knows which games can be hits in the Chinese market, and that gives Activision a great opportunity and partner to grow its Call of Duty franchise. Global spending on mobile games is a massive market, valued at $70 billion currently, more than double the revenue generated on PC and console. With graphics technology in tablets and smartphones achieving parity with gaming consoles, the mobile game industry should continue to dominate global spending on video games, and Activision is just now starting to tackle this market with its most prominent titles. Another critical piece of the puzzle with Activision Blizzard's mobile game strategy is in-game ads. King Digital Entertainment, which Activision acquired in 2016 for $5.9 billion, is the maker of Candy Crush, one of the most popular mobile games of all time according to data from App Annie. Management has discussed its digital advertising opportunity in the same breath as esports and in-game spending, which implies that it sees mobile ads as a significant growth driver. King has been gradually ramping up in-game ads for a segment of its player base this year. While ad revenue is still tiny relative to the company's total revenue, it grew 50% sequentially in the third quarter. King is using a form of in-game advertising called "rewarded video," which offers players in-game content in exchange for watching an ad. Activision generated 57% of its revenue in 2017 from in-game spending. Rewarded video could become one of the primary ways the company monetizes its games, since players won't have to spend money. Long term, Activision has plans to introduce in-game ads throughout its titles. Activision stock has lost nearly half of its value in recent months, but this could represent a tangible buying opportunity. 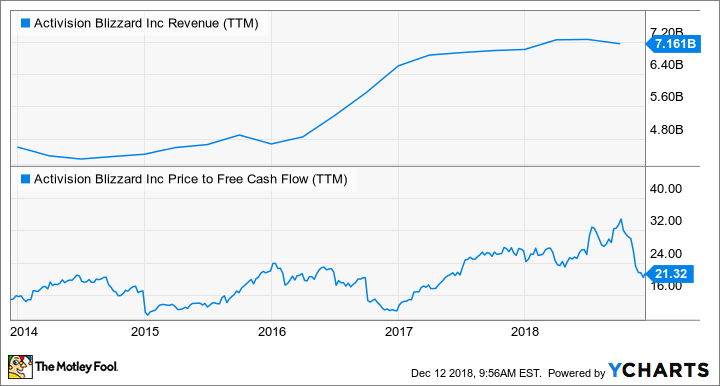 The company has generated $1.8 billion in free cash flow over the last year, which puts the stock's price-to-free-cash-flow ratio at 21. That's much more attractive than the 32 multiple the stock traded for just a few months ago. With expected growth from consumer products, mobile games, and advertising, Activision's current price offers a reasonable entry point into one of the top game makers in the world.